Check out all the incredible opportunities to hang out with fellow bike people this month with these Xtracycle dealer events! 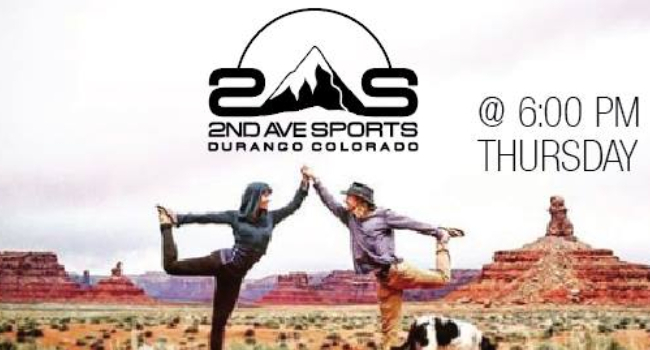 6pm @ 640 E. 2nd Ave.
Join us Thursday for a free yoga night with Brady! We even have mats for you… just bring a buddy and get ready to get yoga’d out. We meet at 6, we ride at 6:30! 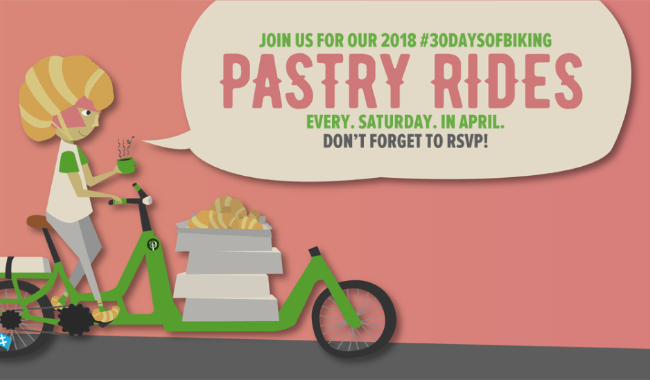 Every Thursday in April, the Joyful Riders Club is celebrating #30daysofbiking with a friendly paced social ride gathering at the fire outside Surly Brewing Company. 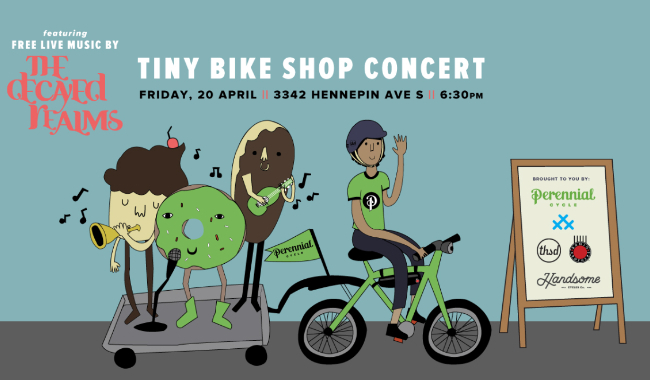 9am – 12pm at 3342 Hennepin Ave.
Ride your bike with us to a local bakery, coffee shop, or other destination and enjoy pastries, coffee, and a raffle with sweet prizes. The April 21st ride is proudly sponsored by Thousand Helmets and Banjo Brothers, and will feature a portrait session so you can get a sweet photo with your bike. 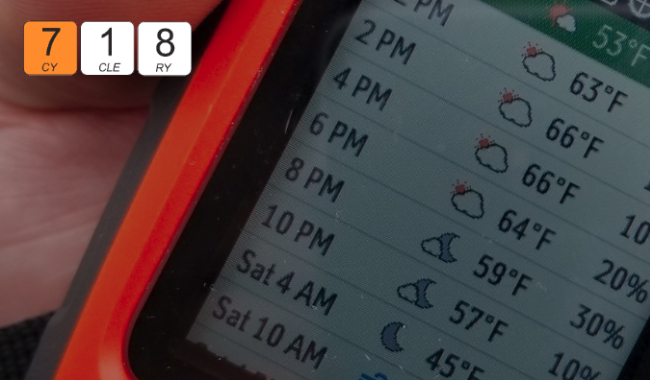 We’ll meet behind Perennial Cycle at 9 am (3342 Hennepin Ave, Minneapolis, MN 55408) and ride at 9:30 am. Your RSVP of “going” helps us ensure we have enough treats for everybody. 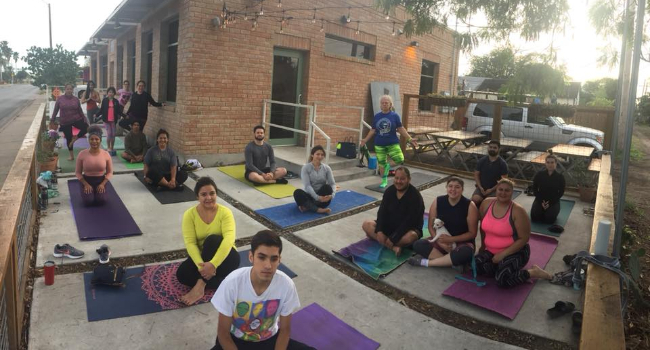 8am – 9am @ 1554 E. 7th St.
“Join us every Sunday morning at 8am on the patio for a free yoga class. Stay for crepes, mimosas, and coffee! If necessary, we will hold the class indoors. 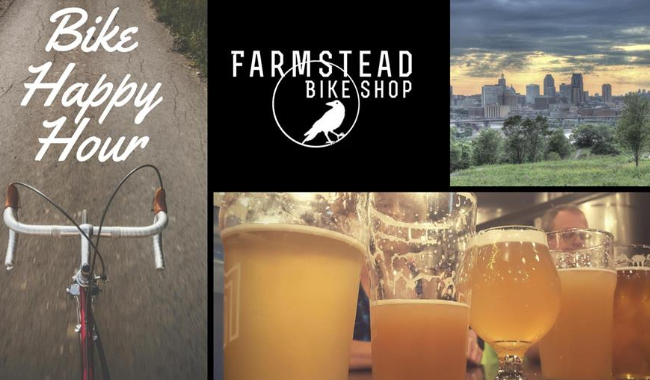 6:30pm – 9pm at 3342 Hennepin Ave.
Where bicycles are concerned, Meredith’s heart is in the liberating power of the riding, and working on, of all types of bikes for all types of people, on any surface and in any weather. 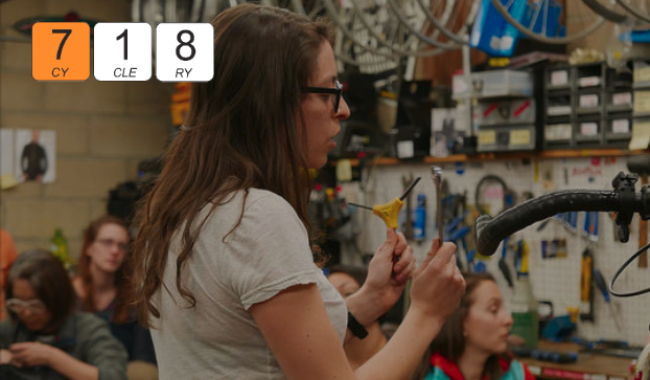 She teaches project-based mathematics at a public high school in Manhattan for recent immigrants, where she also facilitates an after-school bike mechanics and cycling program. 9:30am @ 2115 N. Western Ave.
“Intrigued by the idea of riding with your kids but not sure where to start? 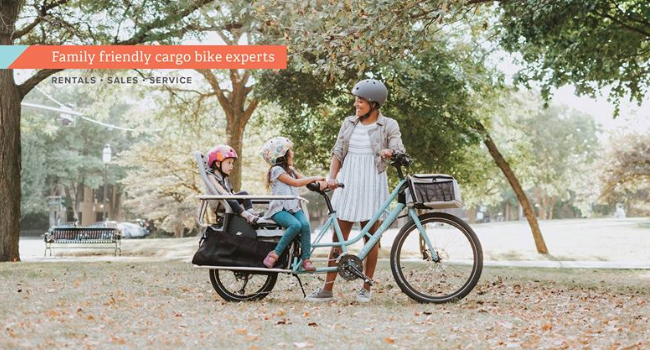 Got questions about cargo bikes or riding in the city? We’re here to help! 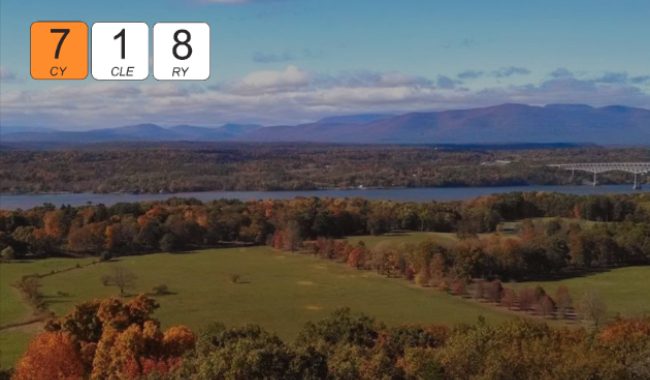 Travel and Logistics: On Saturday, April 27th, we will be taking the 8:32am Metro North Hudson Line train to Poughkeepsie (2 hour train ride). All rides are responsible for train tickets and Bike Passes. Trains back on Sunday(Poughkeepsie to Grand Central) are at 10;32am, 12:32pm and 2:32pm). See event page for more details and to register. 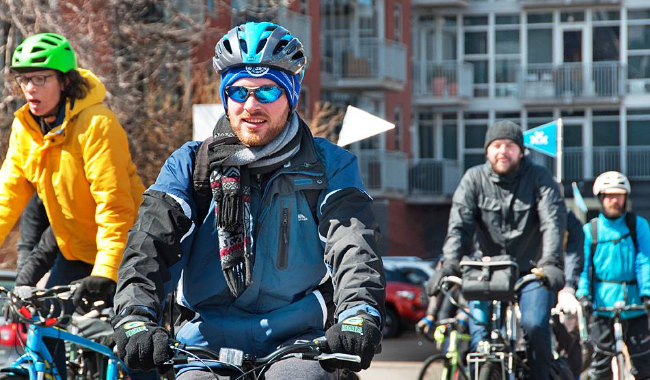 Join us on a guided extended test ride along Calgary’s beautiful bike path network where we will take you on a loop that will demonstrate the comfort and capabilities of today’s modern ebikes. 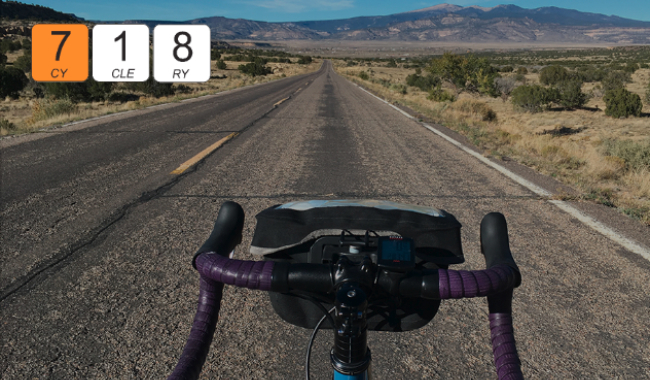 Say goodbye to headwinds, hills, and sweat. You’ll have the opportunity to ride bikes from our demo fleet with models from Riese and Muller and Royal Dutch Gazelle. We’ll stop halfway for a lunch at Sidewalk Citizen in the East Village, switch bikes, and then continue our adventure back to our shop. Pre-ride coffee and cookies by Nadia at our shop, a mid-ride refuel stop at Sidewalk, and a non-alcoholic beverage are included. See event page for more details. 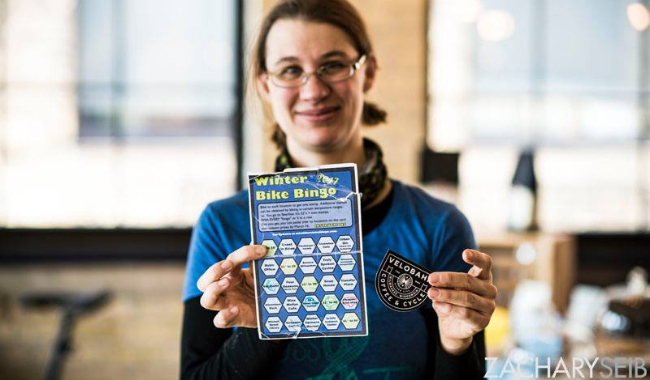 6pm – 8pm at 55519 W. North Ave.
Bring your bingo card and good cheer. Raffle! One ticket for each stamp- up to 25! Come with your bingo card and get one raffle ticket per stamp- get a full card- get a special prize! 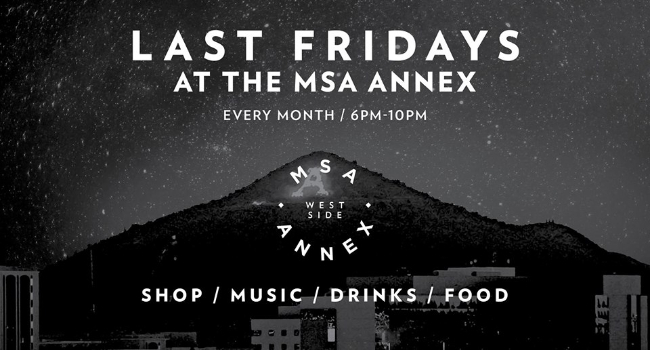 Come for a beverage and socialize- let’s end winter! We all earned it. 7:15pm – 10pm at 4001 Bryant Ave. S.
Gather at the Shop at 7:15, roll out at 7:30. Don’t forget your lid, lights, lock, and layers. Thank you. 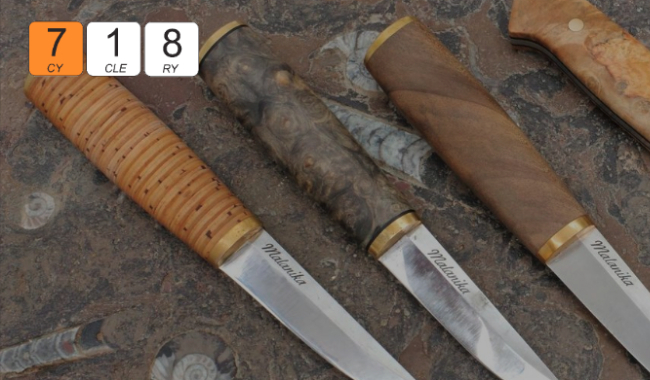 We’ll have some back-up knives, hand files, and stones for you to practice with and expert knife sharpener Greg will be on hand to sharpen your personal knives so you go home ready for your next adventure! You do not need your own knife to attend, just bring yours if you want it sharpened! 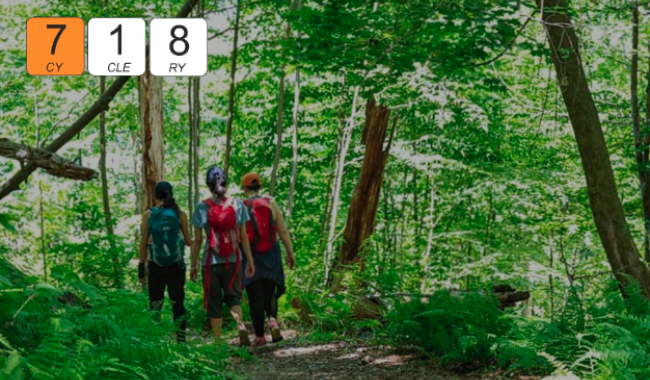 These will be hands on classes and restricted to a maximum of twenty people so come for a more personalized experience with a group of curious (and tactile) outdoor enthusiasts. The series is hosted by our friends at Mighty Hatchet / 718 Cyclery. Note: no door tickets, no waitlist. 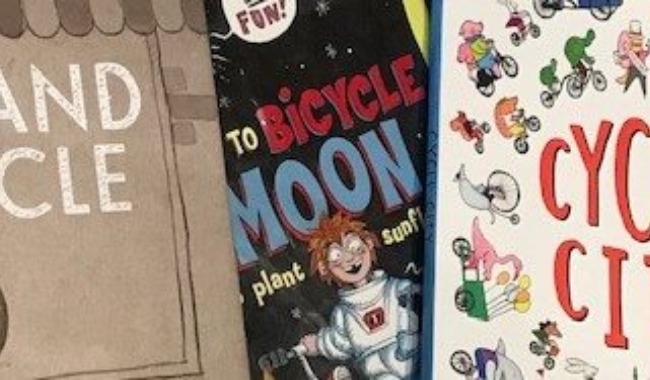 10:30am – 11:30am at 8558 Greenwood Ave.
Join Seattle Public Library and G&O for a Saturday morning story time reading books about our favorite subject: bicycles! We’ll have fresh brewed coffee from Conduit Coffee for parents and stories, songs and toys for kids. This family friendly event is free and fun for kids of all ages! 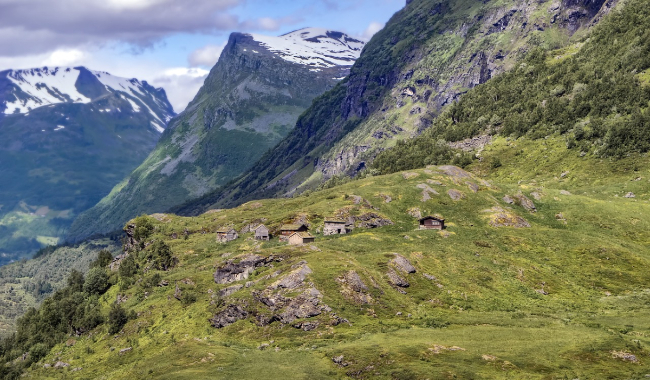 This class covers: 1) How to use various online tools to create a cycling or hiking route. 2) How to download route into handheld GPS device or phone.3) How to share routes with others. 4) How to navigate with said device. Annie will present her cross-country bike trip, riding from Washington, DC to Los Angeles. 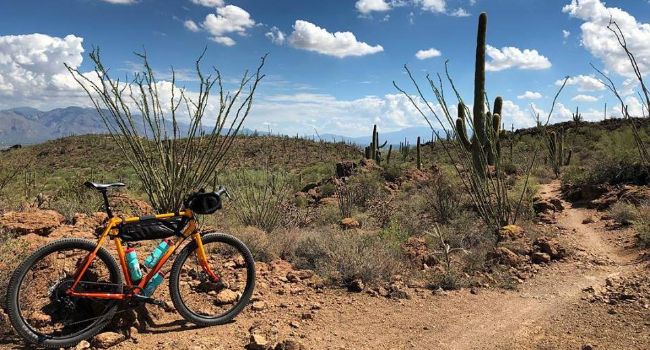 She’ll discuss trip preparation, touring tips, and being solo on the road – all as someone new to bike touring – and will show her bike and gear. Food and Drink will be served. 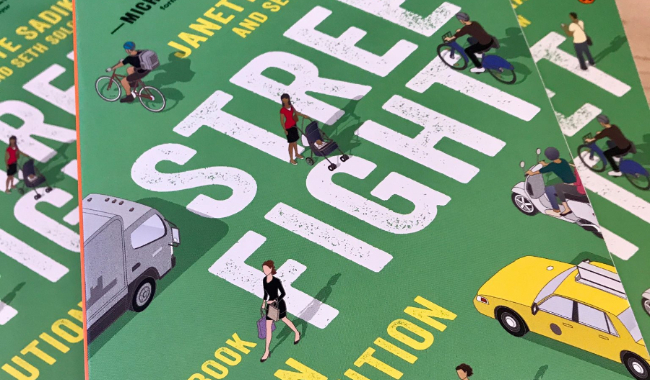 7pm – 8:30pm at 331 N. Winooski Ave.
Mayor Miro Weinberger is hosting the sixth Mayor’s Book Group for a community conversation about “Streetfight: Handbook for an Urban Revolution” by Janette Sadik-Khan. During Sadik-Khan’s tenure as New York City’s transportation commissioner, she changed the City’s streets to make them more dynamic, walkable, and safe. “Streetfight” tells the story of how she did it. At this event, the Mayor and a panel of partners will discuss the ideas covered in the book, as well as active transportation in Burlington and how we make our streets safer and more functional for everyone. Please join us! You can pick up a free copy of “Streetfight” at the Mayor’s Office in City Hall (149 Church Street) as well as at the circulation desk at the Fletcher Free Library. Thank you to the UVM Humanities Center for providing these books. This event is co-hosted by the UVM Humanities Center and Old Spokes Home. 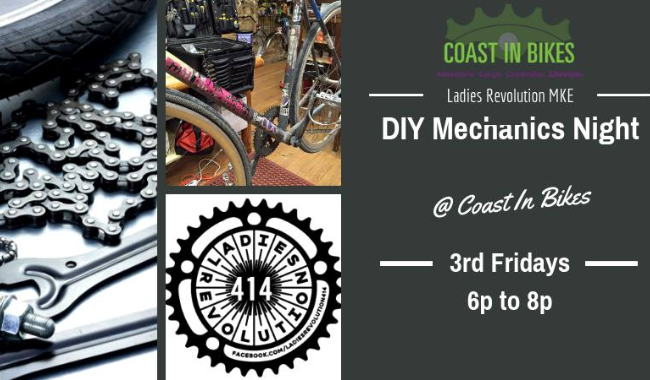 6pm – 9pm at 3334 N. Holton St.
Join us every 3rd Friday at Coast In Bikes. We’ll have all the stands open for you to work on your bike, teach you how to work on your bike and coffee/tea for you to enjoy and just hang out with like-minded FTW cyclists. If you know you need some parts ahead of time- check in with me at coastinbikes@gmail.com or message me at Coast In Bikes FB page to make sure we have it on hand as we keep a low stock.